Fast-food joints aren't usually known for spicy food, but nearly every big chain has one heartburn-inducing diamond in the rough. In our quest to explore the very best of the fast-food canon, we visited 15 different establishments and asked cashiers for their recommendation of the hottest item on the menu. Most all of them had an immediate answer, as well as suggestions of add-ons to increase the heat. 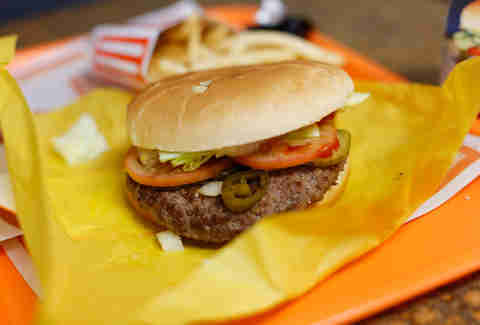 Limited-time offerings were fair game, as well as regional specials, which were mainly jalapeño-topped "Texas burgers" (the tastings took place in Austin, TX over three days). The foods were rated on both spice and flavor, then averaged for a final score. Read on to learn which is the spiciest, best-tasting item, and how many TUMS were eaten during the making of this story. Who Makes the Best Fast-Food Cheeseburger? Spicy Italian is a misnomer. This didn't have any kick. The Italian duo of salami and pepperoni are a great couple, but this sandwich really needs another meat. Three's company, just like that one show your parents watched. The Italian B.M.T. is a definitively better move, and is probably just as spicy, because it has the same ingredients. 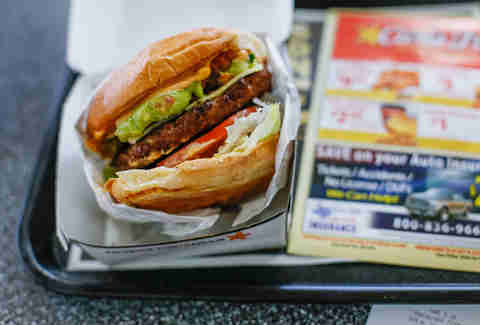 While Carl's offers a Jalapeño Thickburger, the delightful cashier recommended I just add jalapeños to their best-selling bacon-guac bomb instead. She said the level of spice varies on the individual jalapeño, and this jalapeño was a snowflake of the very mild variety. Big ups to Carl's bun, which wins best carb in show, hands down. Unfortunately, the rest of the burger didn't live up to the pillowy bread. When I asked the cashier what the spiciest item on the menu was, she said "nothing", then suggested I add grilled jalapeños for more heat. So I doubled down on jalapeños, hoping for the best. The result was a very dull heat. We're talking Mario Chalmers-style heat. The spicy ketchup was doing most of the work. 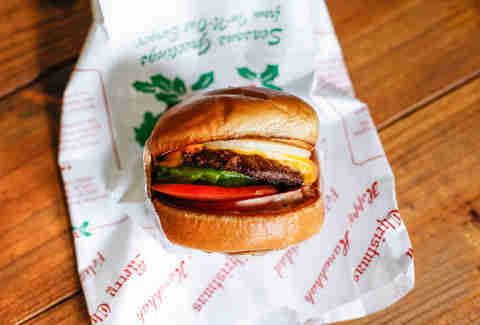 The patty is a little depressing (see photo) and heavily weighed down by veggies. Not my favorite. My drive-up teller did not hesitate to name the spiciest thing on the menu. It was the new Buffalo wings. She wasn't lying, these things have some kick. I instantly reached for my soda. It hits you on the tip of your tongue, a sharp Buffalo heat. Since these are so saucy, it really gets everywhere. Like sand at the beach. The word "wing" is not exactly accurate. These are chicken nuggets with a little less batter. Not to play semantics between wing and nugget, but I think these fall squarely in the nugget camp. The Buffalo sauce is really satisfying at first, and these were steaming hot on a very cold day, which earned them at least one extra point. The aftertaste, however, wasn't my thing. Perhaps I should've washed it down with a shake. My West Coast coworkers assured me that chopped chiles were the move here. I'm surprised this doesn't have a clever name. It's a half-step away from "heartburn-style". The chopped chiles have a nice pickled pop, but like the chain's moniker, the heat is quickly in-n-out. The special sauce and chopped chiles pulled a power-play here. The rest of the burger suffers from the sweetness, and as much as I love In-N-Out, I must concede to the wisdom of Snoop Dogg -- it ain't no fun if the homies can't get none. And in this case the homies are the meat and the cheese. The spice level is very inconsistent bite-to-bite. Three is being generous, but I wouldn't want to short-change this thing. Because my tongue did tingle for a substantial amount of time. Despite the lack of heat, it's not a bad sandwich. The patty is thick, it's a very hearty white meat, and it has just a little bit of peppery flavor. The mayo, lettuce, and tomato are just afterthoughts, but comforting ones. The counter guy at DQ asked me if I was working hard today. I told him I was about to work hard on this burger. He chuckled, and when I asked him if he was working hard, he said "a little". That also describes how spicy this thing is. 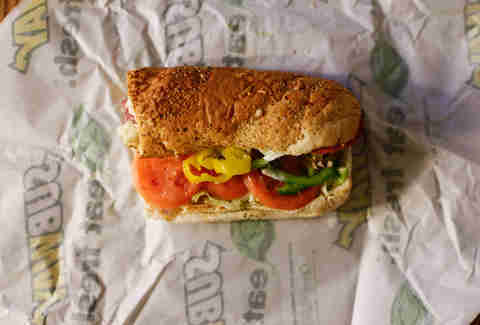 The jalapeños barely register and the Tabasco mayo gives a slow-onset heat, like an oil-filled space heater. This wasn't a bad burger. 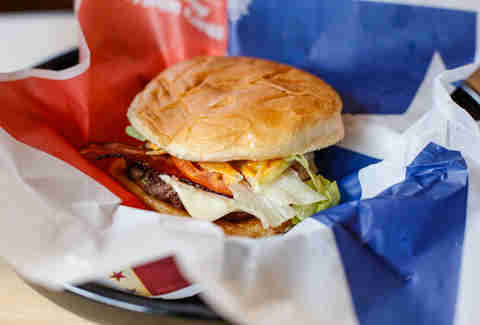 The bacon was super crisp, the pepper Jack was a nice, mellow complement, and the smoky flavor gave it a level of complexity that I did not expect from DQ. The Sriracha is mixed with mayo to dull down the heat, which essentially castrates the, umm, rooster. But luckily the jalapeños come through big-time, giving this a long tail of fire that required several slurps of fountain drink to extinguish. By watering down that Sriracha, they're not just killing the heat, but also the flavor. The four points are mostly for the toasted bun, which is an excellent fast-food vessel. Who makes the best fast-food chicken nuggets? Fire on fire. I doused the taco in a pack of Fire Sauce, and the result was a pleasant tingling throughout my entire mouth. 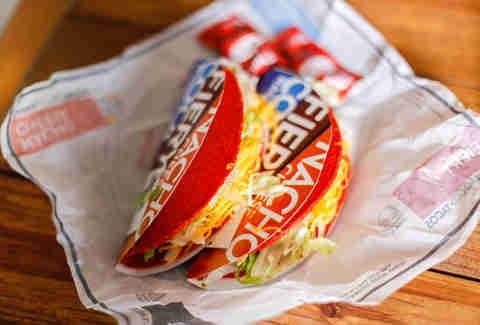 Taco Bell's basic tacos are a masterful gestalt of meat, lettuce, and cheese. Writing about them actually makes me want to reheat the half-finished taco in front of me. But I know that's not a good idea, because I have tried it before. Texas equals jalapeños. It's pretty much that simple. As a Texan, I'm a little offended. Our entire great state is summed up in a handful of... holy cow, these are actually a little spicy! And it causes a strange sensation -- the spice only hits where you bite on the jalapeño, and doesn't spread throughout the rest of your mouth. I've always had a soft spot for the smokiness of BK's "flame-broiled" burgers, and the jalapeños are actually a pretty decent complement. Where there's smoke, it only makes sense to add a little fire. This one hits in the back of the cheeks. It seems the spice is baked deeply into the essence of this chicken patty; it is not a surface-level heat. I'd never eaten one of these before and was pleasantly surprised. Especially for the $1.06 price tag! The lettuce might as well not be there, but the mayo does a nice job of cutting that deep spice. 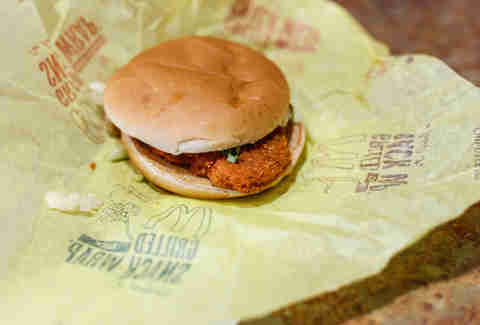 This is much more of a patty than a filet or breast or strip. It's like a flattened chicken nugget, which is totally fine with me. 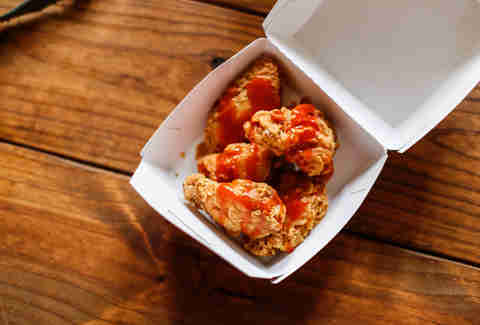 The chicken itself has a crisp, dry bit of heat, but the hot sauce is the real player here. 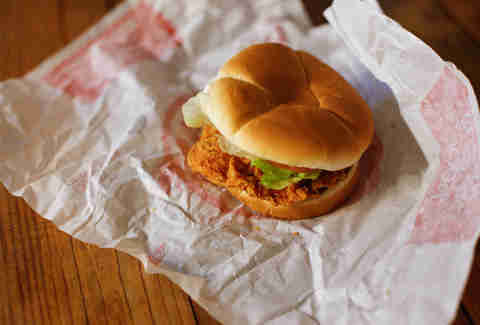 In my ranking of fast-food fried chicken, KFC didn't fare very well. But these? They taste great. I thought they'd be boneless (I was wrong!) so my first bite was a painful one, but once I actually sunk into this meat, I realized why people like KFC so much. The chicken was downright juicy, with the hot sauce flavor masking most of the imperfections. This one hits you underneath your tongue, which is a very vulnerable area in terms of mouth-spice geography. You feel it on the first bite, but it crescendoes as you're taking a moment to write down your elaborate treatises on how different parts of the mouth react to spicy food. Ok, maybe not you. The cashier suggested I add Buffalo sauce to up the spice, and it did just that, adding a wet burst of spice to contrast the dry crispness of the chicken. This is a killer sandwich. 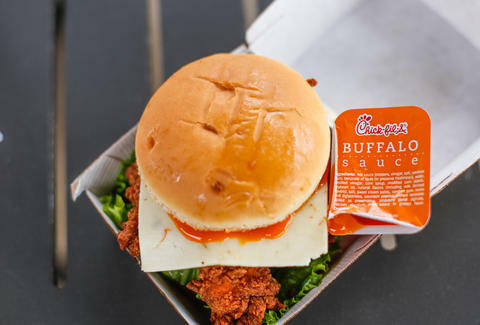 It's no surprise that Chick-fil-A ranked high on our list of fast-food chicken sandwiches. The meat is solid, the breading is super crispy, and the burnt ends of pure batter are very satisfying. The lettuce and tomato are actually functional, and not just window dressing. 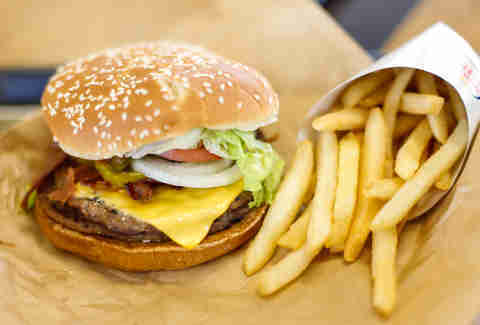 I wanted to eat the whole thing, even though I'd already had two fast-food meals and it was only 12:30pm. 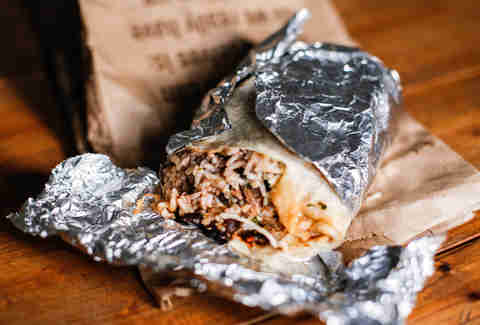 The heat coming out of a Chipotle burrito is like a warm blanket. It's comforting, but it isn't exactly melt-through-an-igloo hot. That said, it wins points on character even if it's not the loudest guy in the room. An $8 burrito and a $1 chicken sandwich aren't exactly apples to oranges, but I'd be remiss to give this anything less than a 10. The barbacoa wasn't taco truck-level salty, but the heavy sodium in the salsa took care of that. A friend once claimed that Chipotle puts sugar in their rice, which isn't true, but it is weirdly sweet in a good way. Think about it next time! When I eat something really spicy, I feel a rush of panic. I get flustered. It's like having a hangnail -- it's a consuming, temporary pain that seems like it'll be with you forever, but it turns out you're just a wuss who needs to stop picking at his nails. 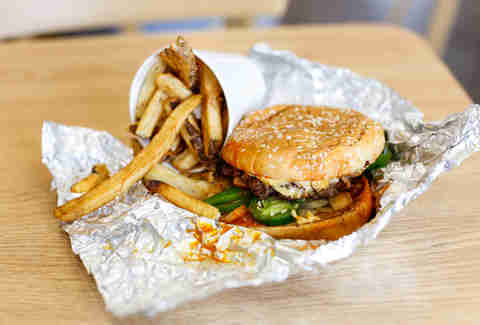 Moral of the story, this burger is hot! Scorching! And not an artificial type of hot like the other burgers; we're talking an all-natural steaminess that I actually felt in my cheeks. Despite the intense heat, I kept eating. Despite the fact that I had three more burgers to try in the next hour, I kept eating. This burger was just right on. The hot sauce gave it a complex flavor, the green peppers had great crunch, and the cheese offered a nice dairy reprieve from those hard-hitting jalapeños. My only complaint is that when I asked for a single patty, the woman at the counter said, "Oh, you want a LITTLE cheeseburger". And that made me feel like less of a man. Next time your coworker says, "Hey, you like spicy food, right?" You say, "No, I don't. Andy Kryza does. You should talk to him!" And then he'll have to eat 15 spicy foods in three days. Spiciness is not something that fast-food joints typically excel at. Look, I'm no snob. 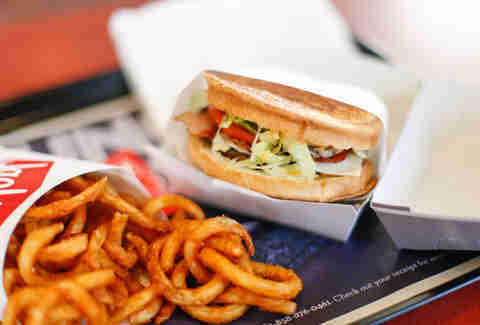 I will get down on a BK Whopper. I've had plenty of Fourth Meals in my life. But it's rare that you can find some genuinely tasty spice from a drive-thru. That said, several of these places surprised me, most notably McDonald's, KFC, and the reigning champion of spice: Five Guys Burgers and Fries. 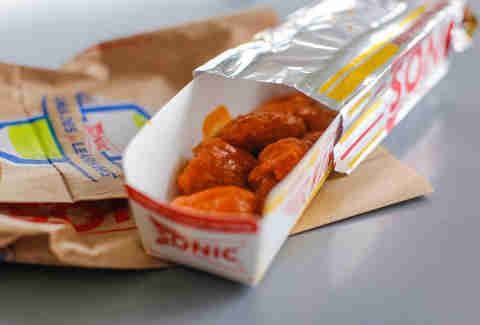 I will be returning there just as soon as my esophagus stops burning. Dan Gentile is a staff writer on Thrillist's Food and Drink team. He ate 10 TUMS during the making of this article. Follow him to salad for dinner at @Dannosphere.